The key areas of life cycle cost analysis (LCCA) and whole life costing (WLC) are exemplified in this volume with accounts of their application to housing stock, a community hydroelectric power system, various aspects of highway infrastructure, and corrosion protective coatings. Sustainable construction and design requires more than compliance with safety requirements and economic constraints, there is also the impact on the environment, the surrounding population and users of the infrastructure. This requires a multidimensional perspective of sustainability to be considered in life cycle costing (LCC) combining current design criteria with these other aspects. 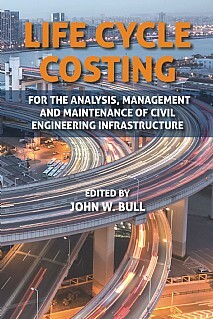 It has become increasingly important to understand the full costs of civil engineering infrastructure, and the main sources of cost, along the whole supply chain and to identify cost reduction opportunities. The conventional procurement approach without the integration of probabilistic life-cycle cost modelling induces substantial long term maintenance costs. Once deterioration and life-cycle cost models have been established, appropriate partnership procurement strategies, associated financing methods and determination of the project period can be developed. LCC includes the cost of planning, design, acquisition, operation, maintenance and disposal of buildings and other construction assets, while WLC additionally includes incomes and other costs such as non-construction costs and externalities. In whole life costing, social, environmental or business costs or benefits are considered as externalities and care must be taken not to double-count the impacts when WLC is used together with LCCA. The international examples included here illustrate practically the methodology of life cycle costing and the application of life-cycle cost analysis to identify the most appropriate method for assessing the relative merits of competing project implementation alternatives. As such it will provide a valuable tool for practising engineers, researchers and advanced students in civil and structural engineering. 1. Life cycle cost analysis of the UK housing stock, Rosa M. Cuéllar-Franca and Adisa Azapagic, both University of Manchester, UK. 2. Case study: Life cycle analysis of a community hydroelectric power system in rural Thailand, Andrew Pascale, The University of Queensland, Australia, Tania Urmee, Murdoch University, Australia and Andrew D. Moore, Principal Sustainability Analyst, Australia. 3. Selection indicators for stabilization of pavement systems, Filippo Praticò, University Mediterranea at Reggio Calabria, Italy, Sireesh Saride, Indian Institute of Technology Hyderabad, India and Anand J. Puppala, The University of Texas at Arlington, USA. 4. Pavement type selection for highway rehabilitation based on a life-cycle cost analysis: validation of California Interstate 710 Project (Phase 1), E.B. Lee, Pohang University of Science and Technology, Korea, Changmo Kim, University of California, USA and John T. Harvey, University of California, USA. Moe M S Cheung, Sichuan University, China. 6. Life cycle analysis of highway composite bridges, H. Gervásio, University of Coimbra, Portugal. It will provide a valuable tool for practising engineers, researchers and advanced students in civil and structural engineering.